Shadow is a 3rd-person multiplayer combat game created in 8 weeks by a team of 4 artists and 5 programmers. The initial concept for this game was inspired by an episode of Samurai Jack, whereby the game’s monotone colour scheme allows players to easily blend into the environment. The secondary goal of the project was to familiarize ourselves with Unreal Engine 3. None of the programmers had any prior experience using the engine, so we would be learning how to implement features using UScript and use the engine’s tools on the fly, from scratch. The areas of the project I spent the most time on include Player movement, camera set-up, animation and animation transitions, networking, and particle implementation. Submersible is a simple two-week project I created after returning to MDS for my Diploma of Game Development. Over the Christmas holidays, I’d retrofitted the DirectX engine I used for Island with a much improved 2D Sprite system, using what I’d learned while working with DirectX sprites on Interstellar Excavation. The game itself is fairly straightforward- Dive in a submarine 10,000 meters to the bottom of the ocean. Obstacles you’ll have to overcome include enemy sea-creatures, lack of light as you dive deeper, and your sub’s physical limitations. Players can kill sea-creatures for money, use the money to buy upgrades at the surface. Simple stuff. You can download Submersible here. This is the final project a team of 7 programmers (including myself) created during our first year at MDS. It took 8 weeks to complete, two of which were spent on pre-production. 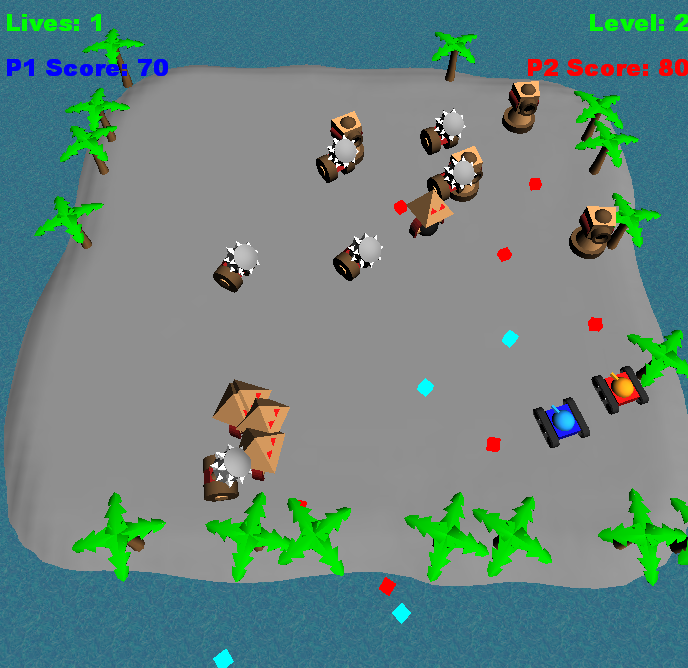 The core scoring mechaninc is similar to the classic lines-and-dots game, in which player are driven to capture territory before their opponents. The game features a top-down perspective, and each player controls a vehicle navigating about a grid of nodes. when four adjacent nodes are captured, the parcel of land inbetween them is claimed, generating income for the player. the player can then spend that income on defenses for the parcel or upgrades for their vehicle. The game continues until the round ends, at which time the each number of land parcels for each player is totalled and a winner is declared. The design goal was to create a game that was easy to jump into, but had enough depth to allow players to formulate a number of unique strategies. The whole of the game was written from the ground up using DirectX, with the exception of audio, where we used FMOD. I was in charge of user interface and AI. This first video shows four human players competing. The following video is 1 human player and 3 AI opponents. The most recent build can found here. Well… technically speaking. The palm trees spawn in random locations around the edges. 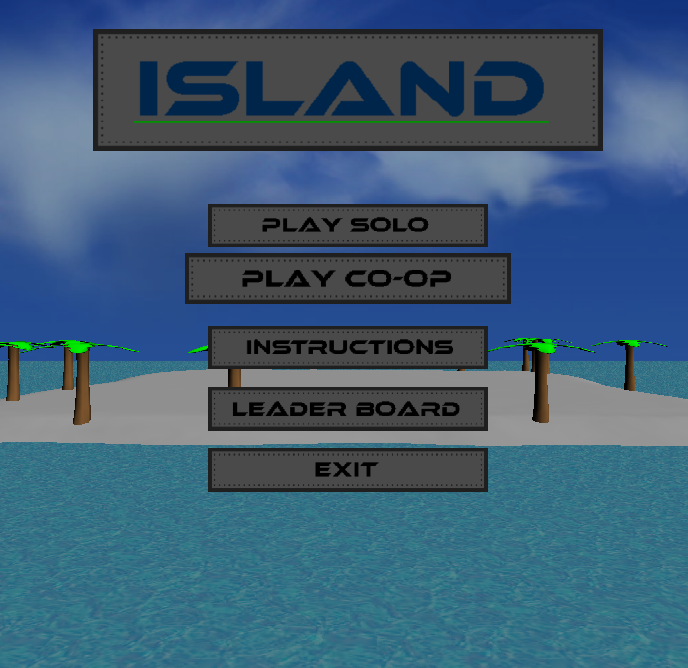 “Island” Is a Robotron clone created in two weeks for the IG300 course component for my Diploma of Interactive Gaming. It marks my first foray into 3D games, using a custom-built engine I compiled whilst learning DirectX. Scrolling Textures, Xbox 360 controller support, and a multitude of game-play features were required. Again, couldn’t resist adding a co-op mode. Also real happy with the way the 3D menu turned out, considering that I spent a single day working on it. You can download ISLAND here. Orbital is a 2D Space Shooter I created for the IG100 course component of my first year at Media Design School. It was my first foray into object-oriented programming, and as such I wanted my concept to be relatively simple. I decided to create a spin on the classic “Space Invaders” by merging it with the dynamics of “Asteroids” and topping it off with a modern regenerating health mechanic. In summary, the player controls a mobile orbital laser cannon, and is tasked with preventing projectiles from reaching the earth. 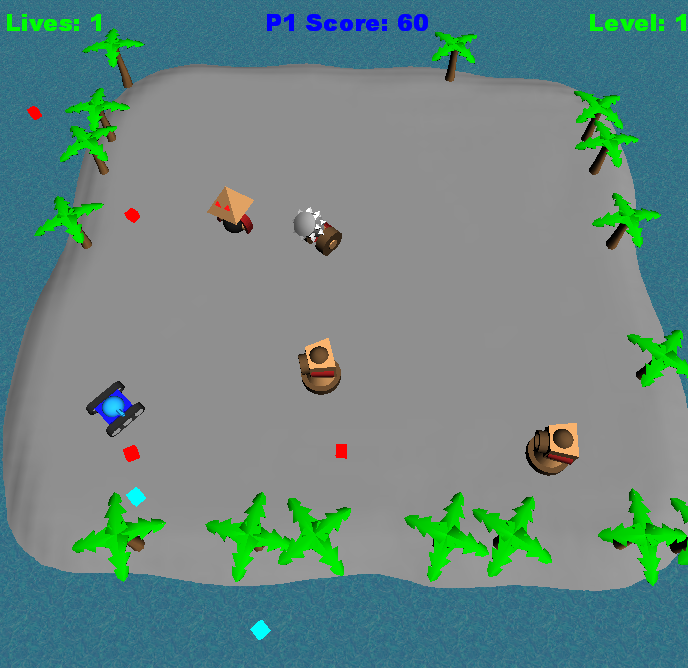 The player’s cannon is effectively invincible- if it’s hit by a projectile, the projectile is destroyed and the player must wait through 5 seconds of inactivity while repairs are underway. Also decided to throw in a co-op mode just for fun. The game uses Windows GDI for rendering and user input. You can download Orbital as a standalone .exe here.